Download "Fees and costs. 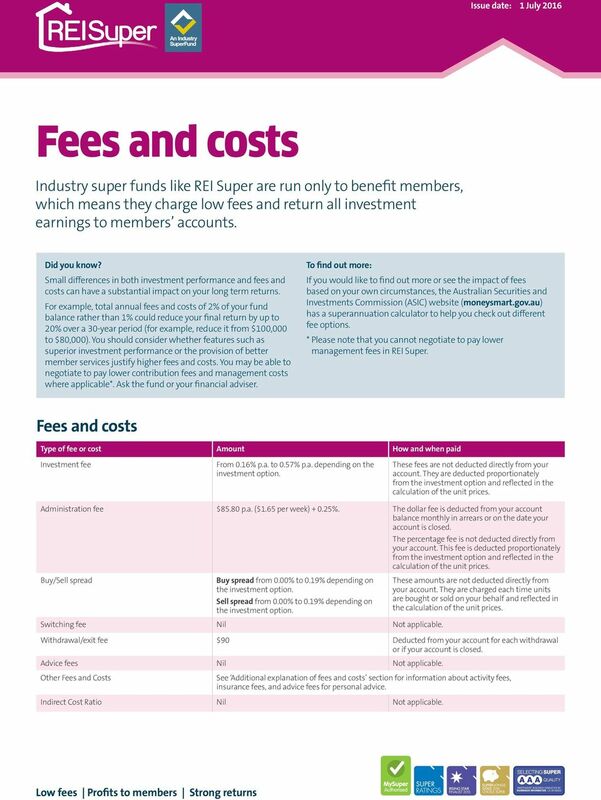 Fees and costs"
1 Issue date: 1 July 2016 and costs Industry super funds like REI Super are run only to benefit members, which means they charge low fees and return all investment earnings to members accounts. Did you know? Small differences in both investment performance and fees and costs can have a substantial impact on your long term returns. For example, total annual fees and costs of 2% of your fund balance rather than 1% could reduce your final return by up to 20% over a 30-year period (for example, reduce it from $100,000 to $80,000). You should consider whether features such as superior investment performance or the provision of better member services justify higher fees and costs. You may be able to negotiate to pay lower contribution fees and management costs where applicable*. Ask the fund or your financial adviser. To find out more: If you would like to find out more or see the impact of fees based on your own circumstances, the Australian Securities and Investments Commission (ASIC) website (moneysmart.gov.au) has a superannuation calculator to help you check out different fee options. * Please note that you cannot negotiate to pay lower management fees in REI Super. and costs Type of fee or cost Amount How and when paid Investment fee From 0.16% p.a. to 0.57% p.a. depending on the investment option. These fees are not deducted directly from your account. They are deducted proportionately from the investment option and reflected in the Administration fee $85.80 p.a. ($1.65 per week) %. The dollar fee is deducted from your account balance monthly in arrears or on the date your account is closed. The percentage fee is not deducted directly from your account. This fee is deducted proportionately from the investment option and reflected in the Buy/Sell spread Buy spread from 0.00% to 0.19% depending on the investment option. Sell spread from 0.00% to 0.19% depending on the investment option. Switching fee Nil Not applicable. These amounts are not deducted directly from your account. They are charged each time units are bought or sold on your behalf and reflected in the Withdrawal/exit fee $90 Deducted from your account for each withdrawal or if your account is closed. Advice fees Nil Not applicable. 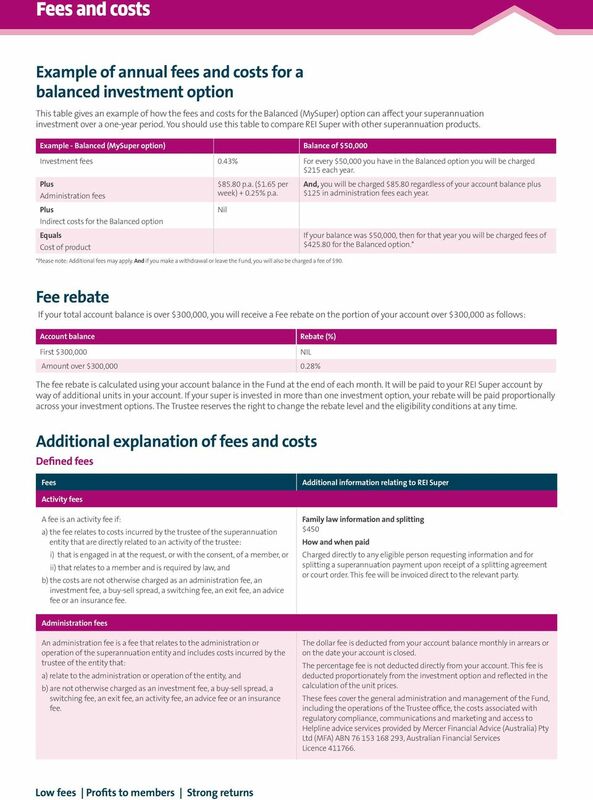 Other and Costs See Additional explanation of fees and costs section for information about activity fees, insurance fees, and advice fees for personal advice. Indirect Cost Ratio Nil Not applicable. 3 and costs Advice fee A fee is an advice fee if: a) the fee relates directly to costs incurred by the trustee of the superannuation entity because of the provision of financial product advice to a member by: i) a trustee of the entity, or ii) another person acting as an employee of, or under an arrangement with, the trustee of the entity, and b) those costs are not otherwise charged as an administration fee, an investment fee, a switching fee, an exit fee, an activity fee or an insurance fee. The cost of providing Helpline advice services to REI Super members is included in the administration fee. An advice fee will only be charged for comprehensive financial advice services offered to REI Super members through Mercer. Mercer financial advisers are authorised representatives of Mercer Financial Advice (Australia) Pty Ltd (MFA) ABN , Australian Financial Services Licence Mercer financial advisers are salaried professionals who do not receive commissions for advice provided to our members. You can arrange an appointment with them to discuss your financial situation. There is no cost or obligation to have the initial consultation. You will be provided with a fixed price quote for any further advice. Any fees are set by agreement between you and Mercer and provided to you in a letter of engagement. Buy/sell spreads A buy-sell spread is a fee to recover transaction costs incurred by the trustee of the superannuation entity in relation to the sale and purchase of assets of the entity. When a contribution is received or a benefit is paid, it is used to purchase or sell units in your investment option. For some investment options, the entry price for the issue of units may be different from the exit price for the redemption of those units. The difference between the entry and exit price represents an allowance for transaction costs, and is commonly referred to as a Buy/Sell spread. 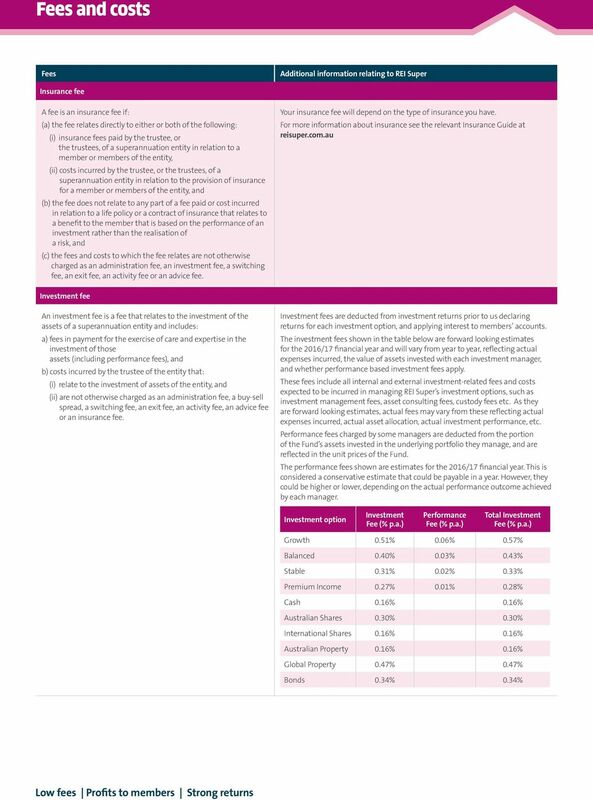 Buy/Sell spreads (if incurred) are additional costs and do not form part of the management costs shown in the Example of annual fees and costs table above. Investment option Buy / Sell spreads Growth 0.19% / 0.19% Balanced 0.14% / 0.14% Stable 0.10% / 0.10% Premium Income 0.09% / 0.09% Cash 0.00% / 0.00% Australian Shares 0.09% / 0.09% International Shares 0.08% / 0.08% Australian Property 0.09% / 0.09% Global Property 0.09% / 0.09% Bonds 0.10% / 0.10% Exit fee An exit fee is a fee to recover the costs of disposing of all or part of members interests in the superannuation entity Note: A dollar-based fee deducted directly from a member s account is not included in the indirect cost ratio. Exit fee $90 How and when paid Deducted from your account for each withdrawal or if your account is closed. Indirect Cost Ratio (ICR) The ICR for a MySuper product or an investment option offered by a superannuation entity, is the ratio of the total of the indirect costs for the MySuper product or investment option, to the total average net assets of the superannuation entity attributed to the MySuper product or investment option. Note: A dollar-based fee deducted directly from a member s account is not included in the indirect cost ratio. Not applicable. Fees and costs VicSuper FutureSaver Member Guide Date prepared 1 July 2016 The information in this document forms part of the VicSuper FutureSaver Product Disclosure Statement (PDS) dated 1 July 2016. 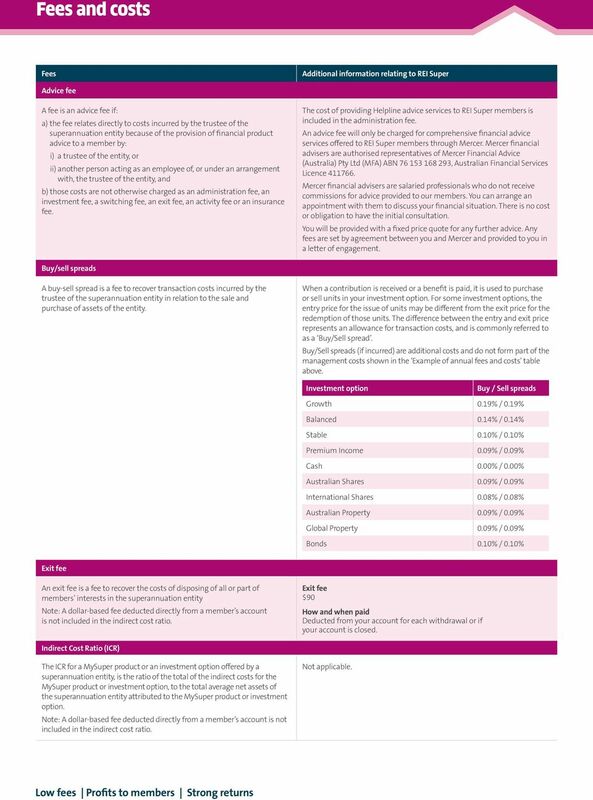 This document is a Fact Sheet for the Product Disclosure Statement dated 22 May 2010 for Flexible Lifetime - Super and Allocated Pension ( PDS ). National Margin Lending Make your investment portfolio work for you Contents What is Margin Lending? 3 Why choose National Margin lending? 5 Why gear? 6 How much can you borrow with National Margin Lending? Supplementary Product Disclosure Statement SuperWrap This Supplementary Product Disclosure Statement ( SPDS ) is dated 20 November 2015 and supplements the Product Disclosure Statement ( PDS ) for SuperWrap. 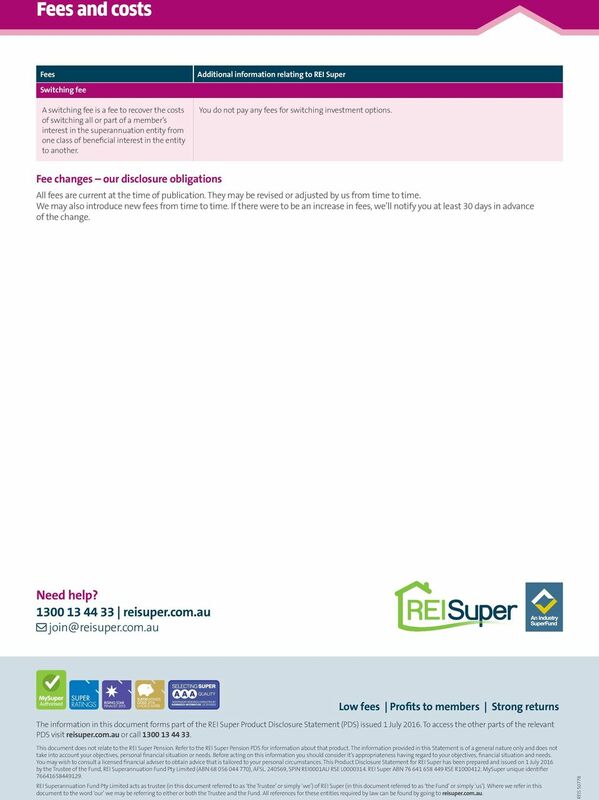 REST Super Member Guide Effective 1 October 2015 REST Super has a MySuper option The information in this document forms part of the REST Super Product Disclosure Statement (PDS), effective 1 October 2015.